The Parkeon Stelio is hugely popular simple and reliable solar powered Pay & Display machine. Use by local authorities throughout the UK, the Stelio is fantastic all purpose machine. 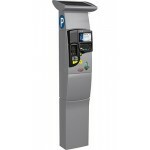 The Parkeon Stelio is hugely popular simple and reliable solar powered Pay & Display machine.